Tsohost is a company from Great Britain that “makes its home in Slough, Berkshire“, which offers a number of web hosting services. The company has been around for 10 years, and over time it has attracted crowds of website and blog owners from around the globe. The provider offers 4 shared hosting plans. Three of them can be purchased on a monthly, 12-month and 24-month basis. Personal plan doesn’t have a monthly payment option, however. The prices on the website are in GBP (pound sterling) and in the table above they are presented in US dollars. The cheapest options are the ones that are offered for the longest term: 24 months. Monthly prices are more expensive: $4.96/mo for a Startup plan vs $3.79/mo (24 months). “Tsohost has been rated 9.2 out of 10 based on 2323 customer reviews,” – this is what we read on their website, and, unfortunately, it doesn’t quite correlate with our impression of a provider. There are several support options, a phone number and a live chat are among them. Yet, while users can submit a ticket 24/7, the former two are only available “07:00 to 24:00“, GMT, we suppose. Well, not so great for international customers. 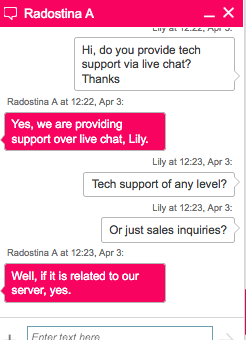 Live chat offers tech support as well. We rated Tsohost.co.uk with 6.6 HRank in 2018 and placed it on the 72d position. Not the highest rating appeared mostly as the result of less than perfect performance. Its uptime charts showed numerous cases of downtime (though never lower than 99% but there are plenty of them). For the last 30 days in 2018, domains on some Shared IPs were been non-responsive for more than 2 hours. Surely, this is not the worst case scenario, but they also were pretty slow in their response (1,500ms on average). Thus, despite the fact that the number of domains hosted with Tsohost was growing, we would recommend to try other providers with better performance for comparison.